Higgins 2.0 is the new code base to implement a PDS. A PDS is a cloud-based service that works on behalf of you, the individual. It gives you a central point of control for personal information about a you. Things like your interests, contact information, addresses, profiles, affiliations, friends, and so on. A PDS is a place where you establish bi-directional data flows between external businesses and your PDS. Or between your friends' PDS and your PDS. 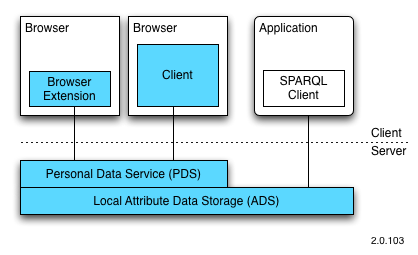 ADS: An RDF/OWL "quad" store holding the user's data described using the vocabularies of the Persona Data Model 2.0. It exposes these data to the Portal and the HBX (see below) via an HTTP/Comet messaging interface. It also exposes the data via a SPARQL endpoint for server-to-server integrations. This page was last modified 16:23, 18 January 2014 by Paul Trevithick. Based on work by Tom Carroll.